In 1938, the Ministry of Education issued its Matters Pertaining to Performance of Group Labor, which launched student labor programs for a certain number of days during summer vacation. In August 1941, the Student Corps, modeled on a military unit, formally organized students and teachers to join in the war effort. In 1944, the Outline of Student Mobilization based on the Outline of Extreme Measures for the Decisive Battle expanded mobilization to a year-round program. 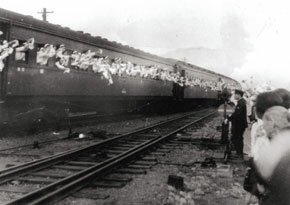 Across the country, groups of students were ordered to work at munitions plants. In addition to assigning students to factories, some schools were actually used as factories. School buildings and other facilities were converted for production. 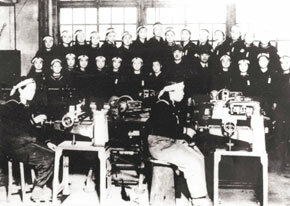 At technical schools, which had their own production equipment, classrooms simply became military factories. The sewing machines at girls' schools were used to sew military uniforms. Students received no explanations from their schools or workplaces regarding wages or working conditions, but national regulations stipulated that, for example, a secondary school student was to be paid 25 yen per month. However, the wages were not paid directly to the students. A lump sum was paid to the school based on the collective achievement of a given school's working students. This payment was distributed to the students after deductions for tuition and other fees. 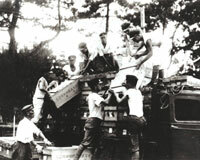 1945 Toyo Kogyo Co., Ltd.
With a minimum of training, students were forced to handle difficult machines. Many were badly injured by the lathes used to make airplane parts. Sometimes the loads students were transporting fell on them. In addition to injuries, severe working conditions caused many illnesses. 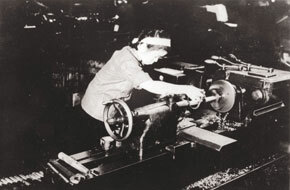 This photo shows a student from Hiroshima Girls' Commercial School using lathes at Toyo Kogyo Co., Ltd.
A headband for a mobilized student to wear while working at an airplane factory. 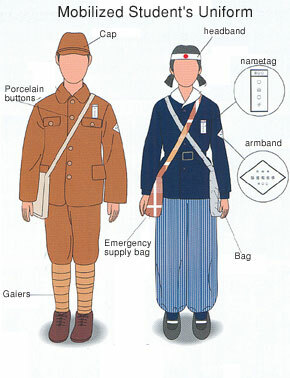 A nametag, armband and school emblems worn by students at Yamanaka Girls' High School. The detailed regulations governing mobilized students stipulated, "Mobilized students shall wear tags identifying them as members of the Student Corps." Thus, it was mandatory to wear the designated nametag and armband when working. During the war, graduation ceremonies were often held in schools and mobilization workplaces. After graduating, absent a special reason (illness or transferring to another school), students would go on to schools where requirements for their majors and minors would be relaxed to allow mobilization assignments to continue. 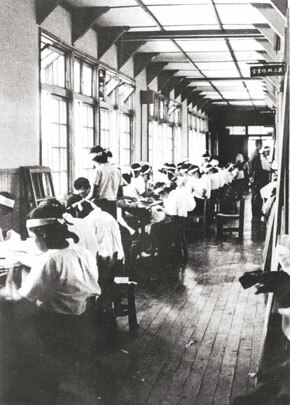 This graduation photo shows students at Yasuda Girls' High School mobilized to work at Koa Sewing Machine Needle Manufacturing Plant. This chart shows the incidence of illnesses and accidents among mobilized students at Hiroshima Girls' High School for Home Economics and Yasuda Girls' High School from July 1 to September 30, 1944. The 249 students mobilized reported a total of 303 incidents of illness or injury. Clearly, mobilization adversely impacted the students' health.